For the historic county of Western Australia, see Lanark County, Western Australia. Lanark County is a county located in the Canadian province of Ontario. Its county seat is Perth, which was first settled in 1816. Most European settlements of the county began in 1816, when Drummond, Beckwith and Bathurst townships were named and initially surveyed. The first farm north of the Rideau was cleared and settled somewhat earlier, in 1790. The county took its name from the town of Lanark in Scotland. Nearly all the townships were named after British public and military figures from the era of early settlement. Effective January 1, 1850, Bathurst District was abolished, and the "United Counties of Lanark and Renfrew" replaced it for municipal and judicial purposes. The counties remained united for electoral purposes in the Parliament of the Province of Canada, referred to as the County of Lanark, until Renfrew gained its own seat in 1853. The separation of Renfrew from Lanark began in 1861, with the creation of a Provisional Municipal Council that held its first meeting in June 1861. The United Counties were dissolved in August 1866. The county is located in the sub-region of Southern Ontario named Eastern Ontario. Geologically, the northern part of the county is in the Canadian Shield and the southern part is in the Great Lakes Basin. The county has two large rivers, the Mississippi and Rideau, each of which empty into the Ottawa River. The landscape is varied including Canadian Shield (with gneiss, granite and marble) as well as limestone plains, with a variety of tills, sands and clays left from the melting of glaciers in the last ice age. At the time of settlement, most of the county was covered in temperate deciduous forest; the dominant forest trees included maple, hemlock, oak and beech. Some of the higher ridges in the west of the county were likely once natural fire barrens, with a distinctive fauna and flora. The clearance of forests began with early settlement, at which time one of the important exports from the area was potash, made from the ashes of the trees burned in clearing. The natural diversity of the landscape supports over 1200 species of plants in the county flora. Seventeen areas have been documented as outstanding examples of plant diversity; these include Blueberry Mountain, Burnt Lands Alvar, Clay Bank Alvar, Christie Lake, Murphy's Point Provincial Park and Almonte Town Park. The county also has 47 provincially significant wetlands. Some of the largest are Blueberry Marsh (north of Perth), the Innisville Wetlands (upstream of Mississippi Lake) and the Goodwood Marsh south of Carleton Place. In addition to David White's list of 17 areas of plant diversity, Paul Keddy lists 17 special places in the county. Both lists have the Burnt Lands Alvar, the Christie Lake Barrens and Murphy's Point Provincial Park. Keddy's list adds areas such as Playfairville Rapids, Lavant/Darling Spillway and the Carleton Place Hackberry stand. Also of interest is an old shoreline which crosses the county diagonally, approximately from Almonte in the northeast to Perth in the southwest. This shoreline was formed about 12,000 years ago near the end of the last ice age when much of the Ottawa Valley was inundated by the Champlain Sea. Many areas below this old shoreline are flat clay plains, with occasional outcrops of gneiss or limestone ridges. Some of the distinctive southern animals in the county include five-lined skinks (Ontario's only species of lizard), black rat snakes and southern flying squirrels. Unusual southern plants include the Arrow arum, a nationally rare wetland plant found near Mississippi Lake. The south-facing cliffs over Big Rideau Lake, including Foley Mountain, have a slightly warmer climate, and therefore support an unusual southern flora including shagbark hickory, tall cinquefoil (Potentilla arguta) and a rare fern, blunt-lobed woodsia. Cliff Bennett provides a list of 26 routes for canoe and kayak exploration of the county. While the town of Smiths Falls is physically within the boundaries of the county, it is a separated municipality and is not under the administration of the county government. The figures below are for the Lanark census division, which combines Lanark County and Smiths Falls. As of the census of 2001, there were 62,495 people, 23,905 households, and 18,090 families residing in the county. The population density was 21 per square kilometre (54/sq mi). There are 27,781 housing units. There were 23,905 households out of which 32.54% had children living with them, 32.54% were married couples living together, 23.32% are one-person households, and 12.31% are other household types. In the county, the population was spread out with 19.68% of the population under the age of 15, 11.78% from 15 to 24, 27.39% from 25 to 44, 25.85% from 45 to 64, and 15.28% who were 65 years of age or older. The median age was 40. The median income for a household in the county was $49,701, and the median income for a family was $56,873. Males have an average income of $45,494 versus $33,525 for females. The county is one of the top centres of maple syrup production in Ontario and describes itself as "The Maple Syrup Capital of Ontario" . There are two provincial parks in Lanark County: Murphy's Point Provincial Park on Big Rideau Lake and Silver Lake Provincial Park along Highway 7 near the west end of the county. The Rideau Trail  and Trans-Canada Trail  both go through Lanark County. There are also several conservation areas run by the Mississippi Valley Conservation Authority, the Rideau Valley Conservation Authority, and the Mississippi Madawaska Land Trust. The K&P rail trail goes through the northwest corner of the county. ^ a b "Lanark County census profile". 2011 Census of Population. Statistics Canada. Retrieved 2012-03-20. ^ Brown, Howard Morton, 1984. Lanark Legacy, Nineteenth Century Glimpses of on Ontario County. Corporation of the County of Lanark, Perth, Ontario and General Store Publishing House, Renfrew, Ontario. ^ a b Mitchell, S.E. (1919). "The County Council". In Smallfield, W.E. ; Campbell, Rev. Robert. The Story of Renfrew: From the Coming of the First Settlers about 1820. Volume One. Renfrew: Smallfield & Son. p. 191. ^ a b Keddy, P.A. 2008. Earth, Water, Fire: An Ecological Profile of Lanark County. General Store Publishing House, Arnprior, Ontario. ^ Catling, Paul and Vivian Brownell. 1999. The flora and ecology of southern Ontario granite barrens. Pages 392-405 in the book Anderson, R.C., J.S. Fralish and J.M. Baskin. 1999. Savannas, Barrens, and Rock Outcrop Plant Communities of North America. Cambridge University Press, Cambridge, UK. ^ "Plants of Lanark County, Ontario--2016 Edition (download plant list)". www.lanarkflora.com. ^ a b "Plants of Lanark County, Ontario--2016 Edition (significant areas)". Lanarkflora.com. Retrieved 21 October 2017. ^ Keddy, P.A. 2008. Earth, Water, Fire: An Ecological Profile of Lanark County. General Store Publishing House, Arnprior. Map 14. ^ Keddy, P.A. 2008. Earth, Water, Fire: An Ecological Profile of Lanark County. General Store Publishing House, Arnprior. Map 17. ^ Lemky, K. and P. Keddy. 1988. An unusual shoreline flora along the Mississippi River, Lanark County. Trail & Landscape 22: 49-52 . ^ Keddy, P.A. 2008. Earth, Water, Fire: An Ecological Profile of Lanark County. General Store Publishing House, Arnprior. Map 5. ^ "Species at Risk - Lanark". Ministry of Natural Resources and Forestry, Government of Ontario, Canada. Queen's Printer for Ontario. 2016. Retrieved October 22, 2017. ^ Keddy, Paul. "Paul Keddy". www.drpaulkeddy.com. ^ "2011 Community Profiles". 2011 Canadian Census. Statistics Canada. July 5, 2013. Retrieved 2012-03-20. ^ "2006 Community Profiles". 2006 Canadian Census. Statistics Canada. March 30, 2011. Retrieved 2012-03-20. ^ "Population and Dwelling Counts, for Canada, Provinces and Territories, and Census Divisions, 2001 and 1996 Censuses". ^ "Lanark County - Maple Syrup Capital of Ontario | MuskokaRegion.com". MuskokaRegion.com. 2014-05-27. Retrieved 2017-11-22. ^ "Locate Provincial Parks in Ontario". www.ontarioparks.com. Retrieved 2017-11-22. 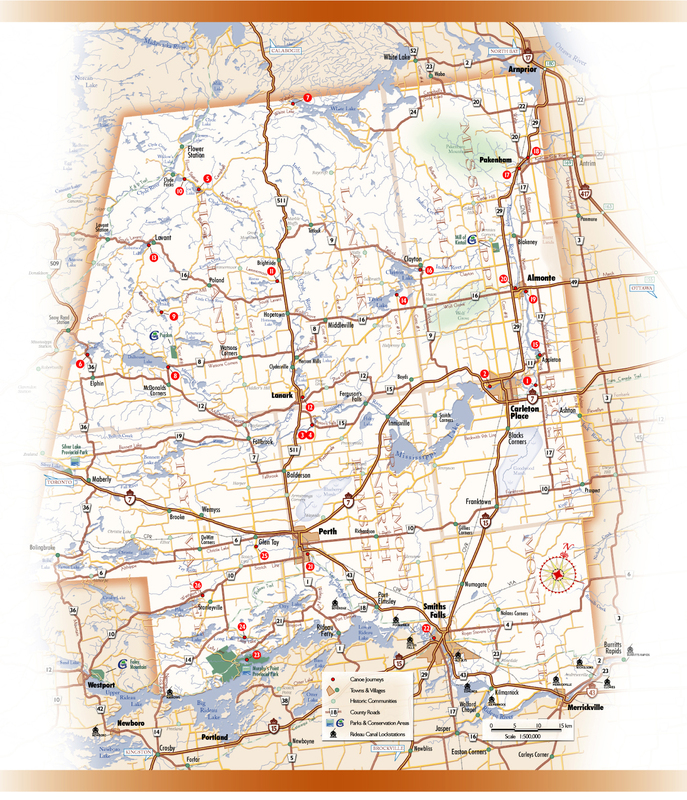 ^ "Rideau Trail Maps". Rideau Trail Association. Retrieved 2017-11-22. ^ "Explore the Map | The Great Trail". TC Trail. 2016-05-19. Retrieved 2017-11-22. ^ "Mississippi Valley Conservation Authority Welcome to Mississippi Valley Conservation Authority - Mississippi Valley Conservation Authority". mvc.on.ca. Retrieved 2017-11-22. ^ "Rideau Valley Conservation Area". www.rvca.ca. Retrieved 2017-11-22. ^ "Mississippi Madawaska Land Trust » Preserving the land. Protecting the future. » Protected Properties". mmlt.ca. Retrieved 2017-11-22. Wikimedia Commons has media related to Lanark County, Ontario. This page was last edited on 14 May 2018, at 20:09 (UTC).